LISTEN: The unexpected healing power of the ukulele. He’s been playing the ukulele for about a year and a half. He picked it up while he was hospitalized after a bone marrow transplant. Brendon was born with a severe form of sickle cell anemia. His red blood cells were crimped and bad at carrying oxygen. The condition caused excruciating pain and some organ damage. When he was 11 years old, he was told he might live into his 20s. He had the transplant to fight those odds. But the ukulele was a different kind of challenge. “Strings scared the hell out of me,” says Brendon, who first played piano, and later—when he could still go to school—clarinet. He says the hospital stays, the surgeries, the experimental treatments—they were necessary, there wasn’t a choice. Hospitals can be scary, often boring, places—especially for the youngest patients. But Brendon is part of the Ukulele Kids Club, an organization that’s found that—in the hands of a sick child—a ukulele can become an instrument of healing. The instrument Brendon plays is one of about 2,000 ukuleles the Ukulele Kids Club has donated to sick kids across the country and in Europe. “We send the children home with this as a gift of music for life,” says Corey Bergman, the guy behind the club, which he started in South Florida. 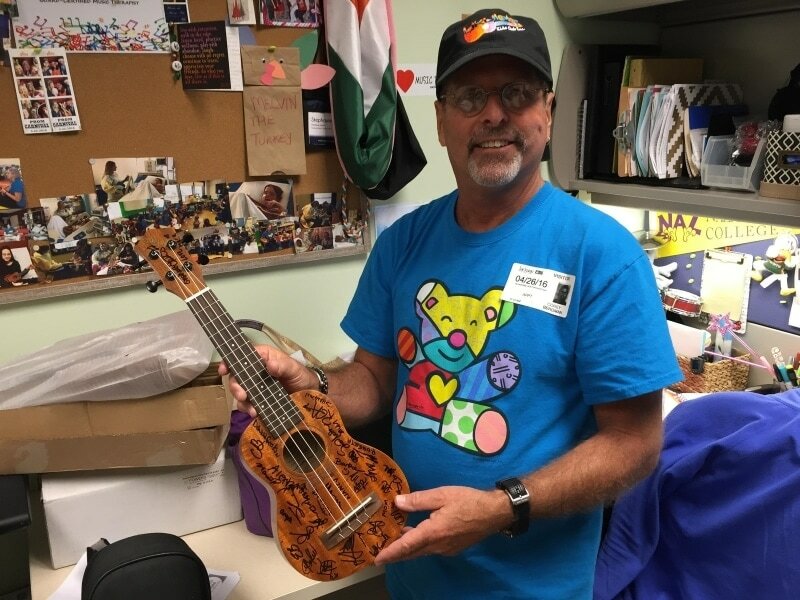 In addition to giving out ukuleles, the club regularly holds group music sessions at children’s hospitals across South Florida. At a recent jam in a community room at Holtz Children’s Hospital, a little boy wearing Teenage Mutant Ninja Turtle pajamas and an IV port in the back of his left hand starts out clinging to his mom. She’d clearly been crying. Over the course of an hour, the boy, Christopher, grabs maracas. Then a harmonica. By the end, he and his mom are both dancing along with the music. This all started few years ago after the death of his 20-year-old son. Jared got a bad viral infection, and nobody saw it coming. While he was grieving, Bergman started volunteering with hospitalized kids. He brought his guitar and played in patient rooms. 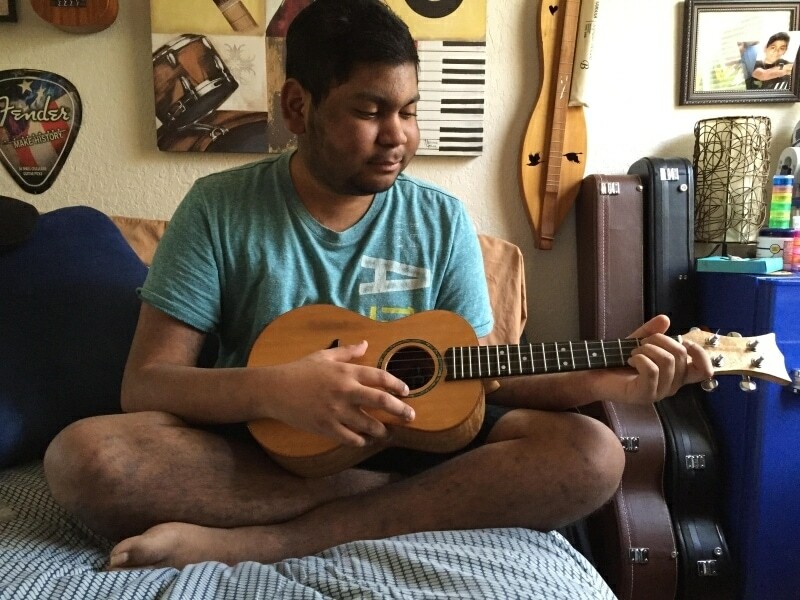 One day, he figured out that a ukulele was perfect for kids in hospital beds: light enough to rest on their laps, small enough to not interfere with IV lines and electrodes. Bergman and his wife rallied friends and networks of musicians to raise money for ukuleles. Hospital music programs aren’t new, but the fact that children get to keep the ukuleles is unusual. “They can own it—in a world where they can’t own very much. And they can’t control very much,” says Stephanie Epstein, a music therapist at Holtz. The Ukulele Kids Club will only donate instruments to hospitals that have a music therapist. As Epstein points out, there are real, therapeutic benefits to music. It’s been shown to lower blood pressure and can be used with pain management. Practicing instruments can be part of physical therapy. But for a lot of parents, it’s not immediately obvious how music fits into their child’s treatment. Brendon’s mom, Ana Santana, was skeptical when a music therapist first waltzed into her son’s hospital room. And then, says Epstein, the music therapist, there’s how music allows sick kids to feel like kids. “It gives them a sense of control and a sense of success and normalcy,” says Epstein. Normalcy—that’s basically what Brendon wants. His immune system is still a little compromised. He wants to drive, which he can’t do with the medicines he’s on. And he wants to get a job. “One of my doctors asked, you have a girlfriend yet? And I’m like, I can’t afford one,” he says and chuckles. Eventually, Brendon wants to compose music for movies.